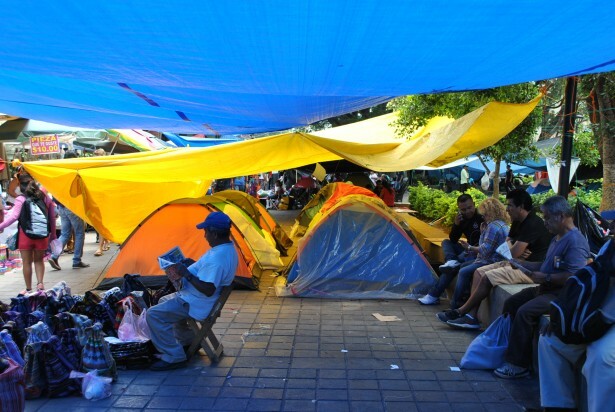 Despite a vicious crackdown, encampments and roadblocks by teachers in the Mexican state of Oaxaca protesting neoliberal education reform continue. The conflict first escalated when two of Oaxaca’s major union leaders were accused of money laundering, arbitrarily detained and taken to maximum security prisons on June 11. Tensions rose, the leaders were not released and police performed various intended evictions across the state, though none of these led to fatalities. Initially the federal police force denied they were carrying guns, however, as evidence mounted, they were forced to admit that they were in possession of weapons. In addition to nine dead, the planned eviction on June 19 left over 100 people wounded and between 22 and 25 disappeared after a confrontation that lasted 15 hours — during which police used tear gas and automatic machine guns to repress the fierce protesters. Hospital workers on the scene were also attacked with tear gas. Meanwhile Oaxaca’s Gov. Gabino Cue, who gave the order for police reinforcement in Nochixtlan, spent the evening at a wedding celebration. Oaxaca didn’t take long to react. Social networks were buzzing with activity and calls for solidarity. The morning after the fatal attacks, community radio and the church were informing people about the rebellion and calling them to participate in the barricades. The National Coordinator of Education Workers Union, or CNTE, a dissident movement within the government-affiliated national teachers union, released a statement demanding the resignation of Gov. Cue, while thousands took to the streets of Oaxaca city to raise their voices against police violence. “Fight, fight, fight, never stop fighting! For a laborers’, peasants’ and popular government!” the crowd shouted as they made their way towards the zocalo, or main square. In 2014 Mexico’s ruling party — the Institutional Revolutionary Party, or PRI, led by President Enrique Peña Nieto — introduced a series of reforms to the health, energy, telecommunications and education sectors, among others. Ever since its proposal a year earlier, teachers slammed the education reform and its focus on labor policy, which they say is not actually concerned with the development of education and schools and is simply aimed at privatization. The recent local election of another PRI government in Oaxaca only confirms this tendency. The teachers had demanded dialogue with the government ever since the introduction of the reforms, however, neither local nor federal governments conceded to any form of negotiation with the teachers until the morning of June 21 when the CNTE announced there would be a meeting with Interior Secretary Miguel Ángel Osorio Chong the next day. Aurelio Nuño, Secretary of Public Education, did not attend the meeting, and it was rescheduled to take place on June 27. With as many as 16 local indigenous languages, Oaxaca represents one of the most culturally and ethnically diverse states in Mexico. Furthermore, Oaxaca is rich in natural resources, with a long history of indigenous and campesino resistance, as well as one of the highest poverty rates in the country. While corrupt government officials and transnational investment companies have denied people of their rights and appropriate their land under the pretence of “progress,” rural and indigenous communities often suffer consequences such as eviction, extortion, cultural annihilation and other forms of abuse and theft. According to the CNTE, the recent reforms are nothing more than a continued attempt to promote homogeneity and an unceasing legacy of racist oppression in an already markedly unequal nation. Oaxaca, and in particular the teachers of Section 22 of the CNTE, have played an important role in resisting the reforms, garnering the support from dissident groups all over Mexico; day laborers of San Quintin, the Mexican Electricians Union, health workers, university students, parents of the 43 missing Ayotzinapa students and the Zapatistas National Liberation Army in Chiapas are only a few examples of the teachers’ national advocates. They support the movement against the privatization of education, as well as the right to access public services, labor rights, food sovereignty and an end to violence in the country. In under a month, members of the CNTE in 18 states have joined the movement, endorsing its demands and setting in motion countless mobilizations across the nation. In addition to this, the movement is gaining support from indigenous communities across Oaxaca’s eight regions. The teachers have made it clear they will not surrender. Garcia is among those fighting for a better future for the next generation of Mexico’s rural and indigenous communities. He is member of the CNTE’s local Section 22, which currently consists of between 75,000 and 83,000 members, time and time again proving its power before the Oaxacan state. Garcia said that he, like many of his colleagues, is drained, and hopes that the government will yield before there is any more violence. The teachers’ struggle in Mexico has its roots in the beginning of the 20th century, forming what is now Latin America’s largest syndicate, the National Union of Education Workers, or SNTE. 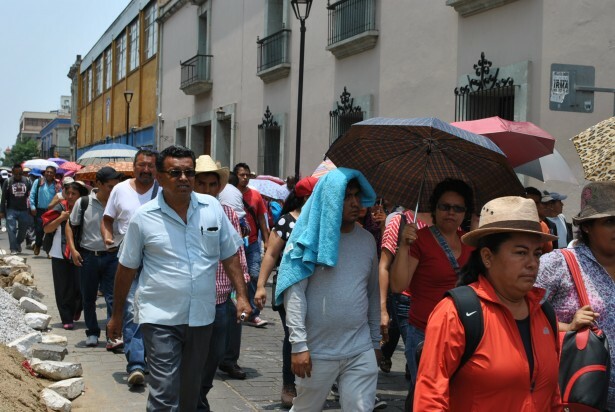 The SNTE is commonly labeled a corporatist union in alliance with the country’s 70-year ruling PRI party, while the CNTE has stood for horizontal and democratic union structures, bringing together many of the country’s regional teachers’ movements. Worsening conditions for many teachers and schools in the poorest states of the country — in combination with the corrupt SNTE — played an important role in galvanizing national protests, and ultimately contributed to the formation of the CNTE in December 1979. Oaxacan teachers of the union’s Section 22 developed important strategies for their movement and contributed to the longevity of the struggle over the years by carrying out peaceful encampments and roadblocks. During one of these encampments, in 2006, Gov. Ulises Ruiz Ortiz threatened to evict the teachers with the help of Mexican federal police. The state ordered an attack on the teachers in the early hours of the morning, which galvanized massive popular support for the union. Community media played a crucial role in counteracting mainstream channels of information that demonized the teachers as corrupt troublemakers, and allowed their voices to be heard. Days later, over 200,000 people streamed onto the streets of Oaxaca to denounce the local government and the dictatorial PRI party rule for their corruption and violent repression. For over five months, the teachers built barricades around the main square and Oaxaca became the scene of a massive popular uprising. Together with over 300 civil society organizations, the teachers formed the Popular Assembly of Oaxaca’s Communities, or APPO, which demanded and achieved the removal of the governor. Tragically, this success was achieved at a high cost. Hundreds of people were kidnapped, disappeared and tortured, and 26 were killed, including an American journalist. 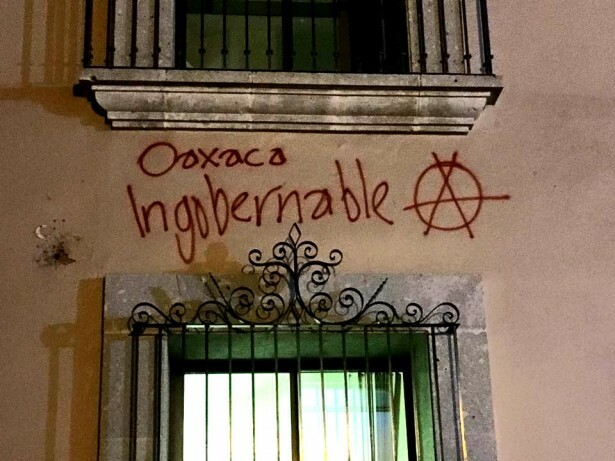 A truth commission led by members of Oaxacan civil society organizations revealed that during the struggle, often referred to as the “Oaxaca Commune,” the state systematically violated human rights. According to author and academic investigator Jose Sotelo Marban, the repression exercised by the police and paramilitary towards the APPO activists falls under the clear definition of “state terrorism.” What happened in Nochixtlan on June 19, was a bitter reminder of these acts of state terror in 2006, almost exactly 10 years ago. According to Reyes, the police are monitoring those teachers attending marches and making sure no classes are missed. Much of the stigma attached to the movement comes from media that label teachers as lazy and stress the time students lose while their teachers are out on the streets protesting. The teachers overcome this issue by working and covering the union duties in shifts, said Reyes. “It’s not easy, since we already lack staff,” she explained. “But we’ve made it work. In our case at least, 100 percent of the parents at our school stand behind us.” Victories such as free school uniforms and breakfast for students have proven to many parents that the teachers’ organization and persistence has born valuable fruits. While Reyes and many others claim the demands of the standardized evaluation are impossible to meet, the state has imposed another repressive mechanism by restricting teachers’ union participation. As if this weren’t enough, in the last five weeks over 4,000 teachers have been dismissed while the salary for others is being withheld as a direct consequence of their participation in the strikes and roadblocks. The teachers’ dissidence has not been beneficial to the Mexican state, challenging its power over the population. Scapegoating the teachers as the root of the problem in the media has been the easiest way for the government to take attention away from failures of the system, seriously underfunded public services and corporate greed and abuse. In addition, the reform was backed by the “Pact for Mexico,” a participatory agreement between the PRI and two leading parties. All of this was decided almost entirely behind closed doors, without a debate, participation of students, parents or specialists, or the consideration of what educational policies have been implemented in the past. In the midst of a frenzy of media attacks against the roadblocks, barricades and lost teaching hours, the fact that the Oaxacan teachers have come up with an alternative reform proposal has been pushed completely out of the spotlight. The proposal, which they have called the Plan for the Transformation of Education in Oaxaca, or PTEO, is based on four main principles: democracy, nationalism, humanism and communitarianism, and was written together with the State Institute for Oaxacan Education. In addition to these principles, it emphasizes the importance of differentiating between Mexico’s cultures and aims to provide Oaxacan schools with more materials and basic infrastructure, such as classrooms, bathrooms and electricity. Among Section 22’s current demands is the liberation of political prisoners, employment security, payment of all withheld salaries, and above all, a fair and peaceful dialogue with the government regarding these demands and the PTOE. As tensions rise and Mexico’s teachers and their supporters prepare for the struggles that await them while they continue to protest peacefully, consciousness about what the reforms really mean for the country is starting to sink in for many people. The excessive use of force exercised by the government is absolutely inexcusable, and goes against the right to peaceful protest and the right to freedom of expression. Shirin Marie-Rose Hess is a communications specialist and freelancer based in Oaxaca de Juarez. Her work is focused on social movements, women's rights and human rights defenders. You can find her on Twitter at @shihess. Thank you to Waging Nonviolence for for covering this important struggle that is receiving so little attention in most US news venues right now. I hope you’ll publish more about what kind of attention and support the Oaxacan teachers are receiving throughout Mexico. when teachers barricade streets they are infringing on the rights of the people and are not waging non-violence.